ANTHONY LOUIS "TONY" RIZZO grew up in Camden NJ, where he attended Cooper B. Hatch Junior High School, Camden County Vocational School, and graduated in 1940 from Woodrow Wilson High School on Federal Street in East Camden. The Rizzo family lived at 714 Tulip Street during the 1930s and 1940s. 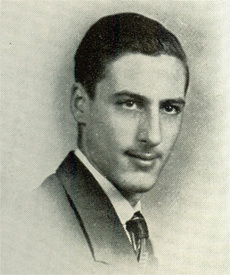 After serving in Europe during World War II, he returned to Camden, worked at the New York Shipbuilding Corporation shipyards while attending Drexel on the G.I. bill. After graduating with a degree in engineering he found work with Hughes Aircraft in California, where he had a long and successful career. Robert Stanton, a classmate and lifelong friend, wrote an article about Tony Rizzo, which he sent to me in May of 2006. I know a guy who has exhibited determination since he was a child. When I met him in Junior High, he already had a toughness of spirit that would stay with him the rest of his life. Not the tallest kid in his neighborhood, he was never picked on by the local bullies because they didn’t frighten him. A few fistfights quickly convinced them that it was best to leave him alone because this kid never gave up and they covered their chagrin by giving him a funny nickname. In spite of that, he was never mean or unkind to anyone else, and was well-liked by the other boys and girls at school, but he was always determined to succeed. Knowing him for so many years, I am certain that his strength of character came directly from his father, who survived such a tough childhood that even I like to tell people about it. There was no nonsense at home while he was growing up, but he always had a role model worth emulating. As my best friend in Hatch Junior High, Woodrow Wilson Senior High, and Camden County Vocational School, we laughed together, worked together after school, and managed to stay out of trouble. I knew what a good mind he had, and how determined he was when he made it up. Perhaps his only shortcoming was his impulsiveness, which gave us some funny memories. Still later, he returned from fighting the Germans in WWII, but would only tell us about the funny things that happened. He then completed his machinists apprentice training at the N. Y. Shipyard where his father was a skilled toolmaker, received an Engineering Degree at Drexel while raising a family, and went on to a successful career with Hughes Aircraft in California, always determined to do his best. Now in our eighties, we are still best friends and he assures me that a few minor physical problems never keep him from a much more active social life than I could ever handle. Who is this young fellow? Anyone who knows Tony Rizzo would have recognized him in the first few paragraphs. Surely the most determined man I have ever met, and a very good friend who still shares many laughs with me.